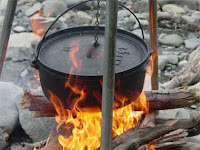 Cooking and camping in the open is a refreshing way to enjoy the outdoors. It's also a great way to impress your family and friends by showing them how well you can cook outside the comfort of your home kitchen. The following outdoor cooking tips and ideas will help you have a good camp cooking experience. It's important to leave the campsite clean so always remember to bring enough garbage bags. Bring biodegradable and environmentally-friendly cleaning agents. Leftover food should be placed in containers and brought home or disposed properly. Clean up is as important as preparation. • Barbequing or grilling burgers, hotdogs, chicken, ribs, steaks, fish, veggies, and even fruits. • A variation for grilling is using foil pouches. Place your seasoned meat, veggies, or fish in the foil, add a pat of butter or oil. Seal tightly and place on the grill. The pouch contents will retain their moisture and flavor. • Dutch oven. A Dutch oven is a deep cast iron or aluminum pot with a tight lid that doesn't allow steam to escape, much like the tin foil method, making for a flavor-filled dish. • Crockpots. Cooking with the crockpot is nothing more than placing all your recipe ingredients in the pot and leaving it all to stew. • Box oven. Feel like a boy scout? Make an oven with a cardboard box, aluminum foil, and some metal rods. When done correctly, will let you bake almost anything. • Pre-chop, peel, or measure the needed ingredients for meals ahead of time and pack in zip-loc bags. Label them correctly. • Block ice will last longer than cubed ice. • All items in coolers should be packed in watertight containers. • Don't light fires near tents or other flammable objects. • Empty zip-loc bags can double as garbage bags. • Clean up after every meal. There are more outdoor cooking tips but these are essential-the rest you will have to experience for yourself. Have fun cooking and camping! 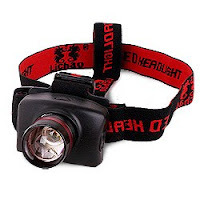 A great tool for outdoor camping to help you see better when you cook is the head lamp flashlight. For a great selection you can take a look here at: http://www.headlampflashlight.com.